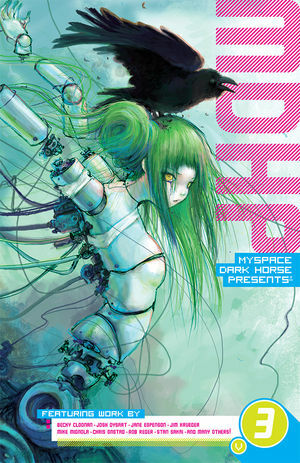 The fourth volume of the online comics anthology MySpace Dark Horse Presents continues to bring you a wide range of genres and classic characters in the Dark Horse tradition. For the first time, Star Wars debuts comic content online with Dark Times: Blue Harvest. Our commitment to webcomics continues to shine with contributions from online-strip creators Chris Onstad, David Malki, and Kate Beaton. Eric Powell?s backwoods-charm-filled series The Goon is the subject of an ?interpretation? from Gossip Whore Ann Romano. Joss Whedon teams with Season Eight cover artist Jo Chen for a special Buffy the Vampire Slayer story, and Guy Davis brings us an all-new installment of The Marquis. * Featuring the talents of Joss Whedon, Jo Chen, Farel Dalrymple, David Malki, Chris Onstad, Eric Powell, Guy Davis and more!